Look, It’s a Bird, It’s a Plane ― No, It’s a … WHAT? Those odd but intriguing purple three-dimensional triangle “things” you may spot along the road are traps for a newly-arrived pest ― the emerald ash borer beetle (EAB). 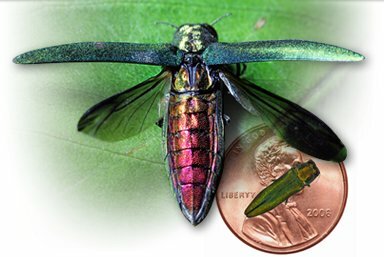 EAB is a small, metallic-green, wood-boring beetle that was found in southeast Michigan in 2002. Native to Asia, it’s believed to have been unknowingly transported to the United States in wood packing material. Since its discovery, the EAB has been detected in six other States. This pest has killed tens of millions of ash trees in southeastern Michigan alone, with tens of millions more lost in Illinois, Indiana, Kentucky, Minnesota, Missouri, New York, Ohio, Ontario, Pennsylvania, Quebec, Virginia, West Virginia, and Wisconsin. Federal and State quarantines have been established in these states to mitigate the spread of EAB. Quarantines prohibit the movement (within the state and out of state) of ash nursery stock, ash logs and lumber with bark, pallets, branches, stumps, etc., and all hardwood chips and firewood. The traps are made out of thin, corrugated, purple plastic that has been coated with non-toxic glue on all three sides. 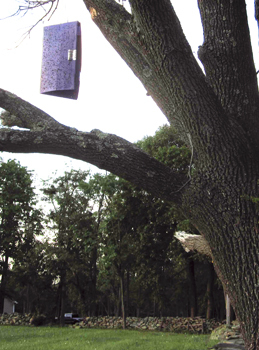 The purple prisms are about 24 inches long and hang vertically in an ash tree or are secured to the trunk of a tree. Why the color purple for the traps? Color frequently plays an important role in nature, and EAB is quite susceptible. In 2003, researchers began investigating EAB to develop an effective detection tool. Scientists from found that buprestids (the insect family to which EAB belongs) in general are more attracted to red and purple hues compared to other colors. Therefore, researchers initiated a study using a variety of red, and purple achieved the best results. http://en.wikipedia.org/wiki/Ash_trees - an article with a guide to types of ash trees. http://www.emeraldashborer.info - has most current information regarding this pest. http://www.emeraldashborer.info/homeownerinfo.cfm - Ash Tree Identification bulletin. Craig M. Greco is a Registered Certified Arborist and owner of YardBirds, Inc. He may be reached at cgtreehugger@verizon.net, 540-338-8392, 703-675-1821.